The United States one hundred-dollar bill ($100) is a denomination of United States currency featuring statesman, inventor, and diplomat Benjamin Franklin on the obverse of the bill. On the reverse of the banknote is an image of Independence Hall. The $100 bill is the largest denomination that has been printed since July 13, 1969, when the denominations of $500, $1,000, $5,000, and $10,000 were retired.The Bureau of Engraving and Printing says the average life of a $100 bill in circulation is 90 months (7.5 years) before it is replaced due to wear and tear. The bills are also commonly referred to as “Benjamins”, in reference to the use of Benjamin Franklin’s portrait on the denomination, or “C-Notes”, based on the Roman numeral for 100. The bill is one of two denominations printed today that does not feature a President of the United States; the other is the $10 bill, featuring Alexander Hamilton. The time on the clock of Independence Hall on the reverse, according to the U.S. Bureau of Engraving and Printing, shows approximately 4:10 on the older contemporary notes and 10:30 on the series 2009A notes released in 2013. The Series 2009 $100 bill redesign was unveiled on April 21, 2010, and was to be issued to the public on February 11, 2011, but production was shut down in December 2010 because as many as 30% were unusable due to a manufacturing flaw. A vertical crease in the paper reveals a blank space on the bill when pulled out. Specifically, during initial production it was noticed that occasionally a sheet of notes (32 banknotes per sheet) would crease. In their replacement, and continuing the high demand of this denomination, the Series 2006A was issued retaining the previous design (1996-generation). 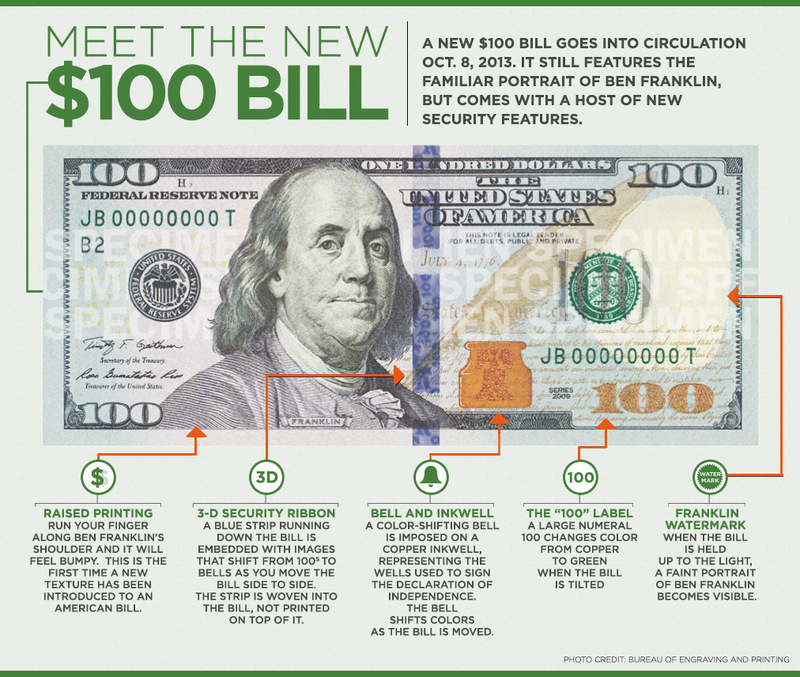 On April 24, 2013, the Federal Reserve announced the new $100 bill would enter circulation on October 8, 2013. The new bill will cost 12.6 cents to produce and have a blue ribbon woven into the center of the currency with “100” and Liberty Bells, alternating, that appear when the bill is tilted. According to the Federal Reserve, more than two-thirds of all $100 notes circulate outside of the United States making it the most popular banknote.